Are You Under Valuing Your Client's Case? This is the first article in a series that I will be bringing to you over the next 8 months. In this first article I hope to shed light on a simple misconception of whiplash and help you determine if your client or claimant has 5-8% impairment or 25-28% impairment. The latter will allow for increased settlement demands and should improve settlement offers. It also will help you weed out those few that are trying to “pull one over” on the system, which cost all of us in the end, as the testing cannot be faked. Whiplash is an outdated term, but we all are familiar with it. 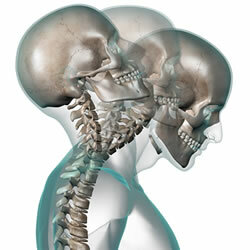 Most often the whiplash injury is thought of as a rear end impact flexion/extension injury. This term is dated and we should avoid using it outside of a laymen conversion. Cervical strain injuries after a motor vehicle crash (MVC) should be referred to as a cervical acceleration/ deceleration (CAD) injury. This eliminates the single motion of injury and is more accurate for frontal impact, side impact, or rear end collisions. Many people who have never experienced a CAD injury personally, or had a close family member experience it, talk about this type of injury with a wink and a smile, right? Let’s examine why: The patient sits in front of his or her physician 12 months after the MVC and tells them how much they hurt, with complaints of neck pain, headaches, mid-back pain and dizziness. Yet, in the physical exam the neck range of motion is normal or near normal. Many of them are working, but claim the pain is worse with activity and some even claim the neck hurts while sitting still or driving, despite their normal MRI and plain film x-ray findings. In the past, this type of patient would be looked upon as a malinger or a magnifier, embellishing the symptoms trying to make a quick “payday” or “win the lottery”. Patients do have neck strain CAD injuries after an accident causing pain or soreness, but they often recover in 2-12 weeks.3 This cervical strain injury would receive a whole person impairment of 0-5%1 and is the classification that I see both insurance adjustors and some of my patients’ attorneys place all CAD injuries. There are, however, patients who have more than mild strains to the muscles. In these confusing cases the patient just will not get better, despite a normal MRI, a MRI revealing a degenerative disc, or normal CT scans, as well as normal radiographs. It is important to remember that most radiologists read plain film radiographs for pathology and not mechanical faults like AOMSI. Do not believe me? Call the radiologist listed at the bottom of your next normal cervical x-ray report and ask them to explain AOMSI to you. Second, ask them to recall the last time they measured a film using the criteria explained in the Guides to the Evaluation of Permanent Impairment, 5th edition. In my experience, this term is often one that many attorneys and doctors have never heard of or do not completely understand. AOMSI is the alteration of motion segment integrity, meaning an increased translation (hypermobility) or angular motion, or decreased motion as in a spinal fusion.1 AOMSI is determined by computerized line drawings on cervical stress films, more specifically flexion and extension views, as you would see in the medical records. The design of the test is to stress the injured structures that support the spine and, as a result, this test often causes a reproduction of the client/claimant’s complaints. There is a second way to determine this injury known as digital motion radiographs (DMX), which is video fluoroscopy of the spine. While this test looks great (because you see full motion of the spine) the radiologist will read this study at the end points of range of motion as a still shot; the same method of analysis as in plain film measurements as described in the Guides to the Evaluation of Permanent Impairment, 5th edition. I have found the advantage is the person performing the DMX understands that the client/ claimant has to move to fully to the end range of motion for accurate measurements and the studies are both analyzed and read for pathology by a radiologist who understands the findings of AOMSI. If radiographs are performed elsewhere, usually the radiologist reads only for pathology and then the films would have to be referred to a second radiologist for the proper analysis of AOMSI. How many of your CAD injured client/claimant’s with pain longer than 3 months have stress films performed? Is the provider of this injured person looking for this injury? Does the radiologist know and perform the proper analysis to make the correct diagnosis? 1. Ask questions to the client and to the provider. Ongoing pain longer than 8-12 weeks post MVC, in the absence of neurological compromise or fracture, stress radiographs or video fluoroscopy might provide your answer. 2. Seek out someone who understands the injury. If you are not sure if the provider “gets it” or the claimant is not being truthful, then request an independent chiropractic/medical examination. Just make sure the examiner understands these types of injuries. Although frustrating, I had to refer a patient last year to a surgeon out of state who understood this injury and performed the necessary stabilization surgery. 3. Findings of AOMSI need to be identified either as a probable pre-existing condition or a probable a new condition? Experienced clinicians will be able to advise you on this matter. Evaluating AOMSI will help you separate those temporary CAD injuries from the permanent CAD injuries and determine the real value of your case.